Vanilla Bourbon Peach sounded like a scent straight up my alley, a scent I knew I would enjoy. I kind of dismissed the bourbon component and figured this candle would smell like a luscious peaches and cream. That was my hope anyway. Vanilla Bourbon, lush white peach, sugared musk. With essential oils. Essential oils? The only one that could possibly be would be the vanilla. Smelling the wax, my nose detected the sweetest sugary peach with the perfect touch of cream and maybe a teeny hint of musk as well. Whatever I was detecting, it smelled very sweet and pretty. I liked it based off cold sniff. The true test though is once the candle is burning. I lit this candle in my master bedroom to start out and waited for the magic to begin. It didn’t take long… maybe ten minutes or so. The aroma… YUM!!! The sweetest peaches and cream filled my bedroom with fragrance and then some. Yep, this scent didn’t just stay in my bedroom, it fragranced my big open bathroom and even moved into my living room and open kitchen. 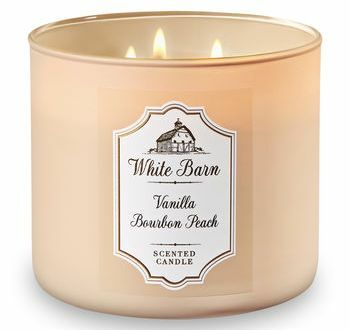 Basically, the entire upper level of my home smelled like sweet peaches and vanilla. Loved, loved, LOVED it!! Bourbon? As expected, I didn’t really smell bourbon as mentioned in the description and I was perfectly fine with that. 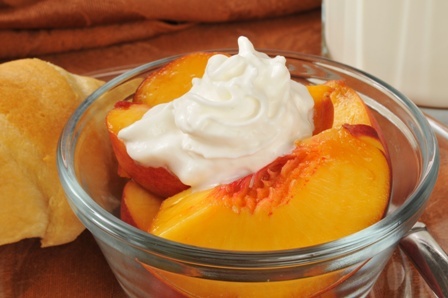 What I could smell was perfect… ripe peaches and cream. Strength – I would rate this candle a 10 out of 10 in any size room. It’s a room filler folks and I loved every second of it. This candle burned great! No wick issues. Clean burning from start to finish. If you love the aroma of sweet peaches, this is definitely a candle you’ll want to try… or at the very least, go sniff one next time you’re at a Bath & Body Works store. I really enjoyed this one and plan on purchasing another one soon. It was sweet, fresh and super strong. I smelled the bourbon, or some kind of boozey languishness! It smelled what I imagined to be apricot brandy. Loved it, not your average peach scent – and definitely strong!